New HTML Editor Option: TinyMCE is here! One-click ability to insert custom, pre-defined HTML snippets at the cursor location. Additionally, with the TinyMCE editor, you can switch between the Plain Text Editor and the HTML editor instantly, without having to re-load the page. While the Java-based EditLive is still quite powerful, some users found it too slow to load and too clunky for rapid keystrokes. The TinyMCE editor is powerful, feature-rich, and lightning fast. To set your account to use TinyMCE, begin composing a new message. Click the Settings Icon and choose the TinyMCE editor out of the three available options. 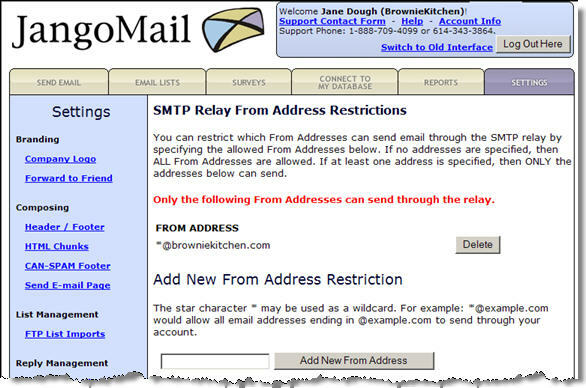 We've launched a new feature that allows you to restrict who can use JangoMail via the SMTP relay service by From Address. Under Settings > Transactional > From Addresses, you may designate which email addresses and domains can send through the relay. Ensuring good delivery of customer campaigns is of paramount importance here at JangoMail. We've blogged before about steps you as a user can take to help boost your deliverability. Now, we've taken it a step further and created a tool to help you see what you might be able to change to optimize delivery of your campaigns. The new tool (fittingly named the "Delivery Optimization Tool" can be accessed from your Reports screen by clicking the ***Delivery Tools*** drop-down and choosing Delivery Optimization. The Delivery Optimization Tool has two different modes of operation. 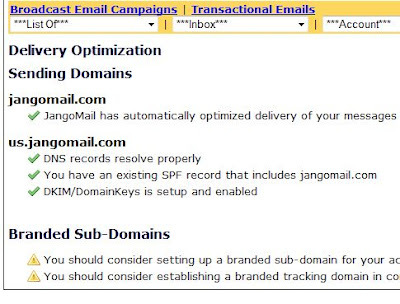 In the first, the tool will analyze the most recent domains you've used for sending in both JangoMail and JangoSMTP; in the second, you can analyze a specific domain. The former is good for general use while the latter is handy if you are setting up a new domain that you have not yet sent from and want to verify you've taken all the correct steps for delivery optimization. Make your selection (and enter a domain name if applicable) and click the Optimize button to start the analysis. You'll get a report listing any steps you should consider to help improve delivery. And of course, if you need any assistance implementing the steps outlined in your report feel free to contact your JangoMail / JangoSMTP support team. We've just launched a new feature under Lists that allows you to merge one Email List into another. You can do this via the web interface by going to the Lists tab, selecting the destination Email List for which you want to merge into, and visiting the List Tools tab. 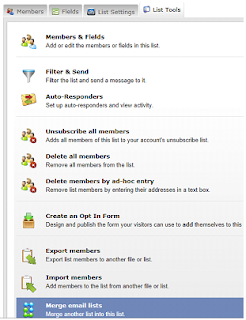 There you select Merge email lists and then select the source Email List whose members should be merged. 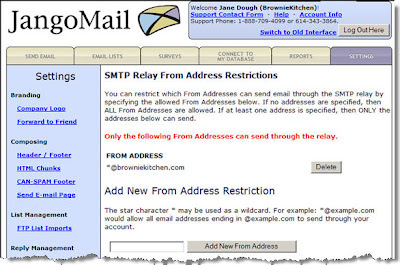 Notes: The email addresses in the Source Email List will then be copied to the Destination Email List. The Source Email List will not be modified. 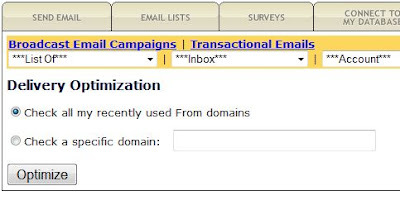 If the two Email Lists have different fields, then only the fields they have in common will be copied. Merges two Email Lists by copying the List members from the Source List to the Destination List. Returns a String. We have launched a new feature that will give you the option to preserve custom headers when using the JangoMail SMTP relay at relay.jangosmtp.net. 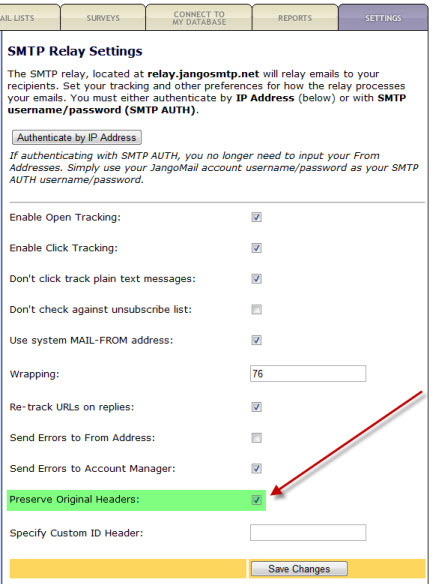 To enable this option, go to Settings --> SMTP Relay, and check the Preserve Headers box. those will also be preserved. We will be enabling an option in a future launch such that you can set a particular custom header's value to show in reports, allowing you to tie each individual sent email, open, and click back to your internal system's own identification mechanism.